Ceviche 103 is quite possibly the best Peruvian Restaurant in Barcelona for your buck. When it comes to South American Food in Barcelona, Peruvian food has comfortably carved its own niche in the great international cuisines options. And it’s well-deserved. I'm a fan of Peruvian food: Papa a la huancaina (Huancayo-style potatoes) and Causas? Bring it! Chairo, Copús, and Ceviche? Yes, please! The variety of Peruvian dishes (close to 500) is impressive to say the least. Different regions of the country have their own delectable creations and with over 4,000 varieties of native potatoes, that's right, a 4 with three 0s, imagine the flavors, textures and creativity that can be derived from such a savory staple. American wine and food critic for The New York Times. Eric Asimov, has described Peruvian food as one of the world's most important cuisines and as an exemplar of fusion cuisine (Nikkei for example, which I also write about here), due to its long multicultural history. If you find yourself in Barcelona and want to scratch your Peruvian food itch then you really need to try Ceviche 103. Head chef Roberto Sihuay has spent several years perfecting his craft in restaurants in Peru as well as Spain. His vision is to offer tasty original dishes but not skimping on detail or presentation. According to him, his philosophy is to “focus on the traditional flavors of Peruvian cuisine applying cooking techniques that captivate the most discerning palates." Ceviche 103, as the name might imply, doesn’t offer 103 types of ceviche, they offer 8 varieties and they are all magnificent. Besides ceviche, they have popular and mouth-watering plates such as Causas (which is a mashed yellow potato dumpling mixed with key lime, onion, chili and oil and to which you add tuna, chicken or other toppings), rice with seafood (reminiscent of paella), and wild sea bass in leche de tigre which is a juice that is comprised of white wine, vodka or pisco, ground green chillies, salt and pepper. It's an awesome hangover cure as well, trust me. You can check out there menu here to start getting prepped before your actual visit. 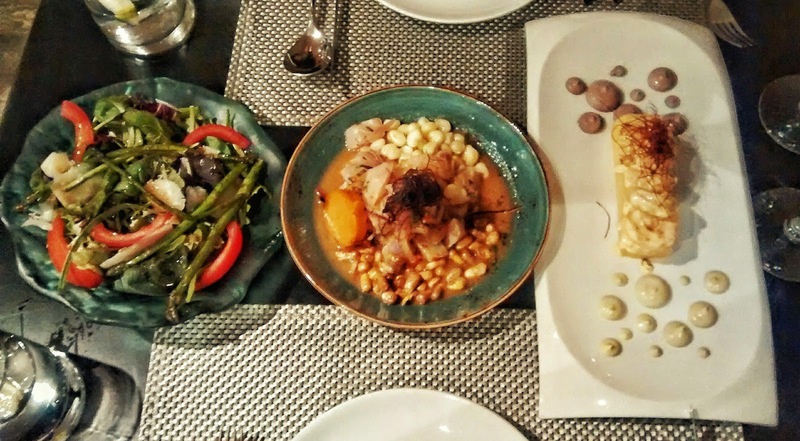 As for the restaurant, it is a friendly, modern and colorful place and an excellent choice to enjoy some of the best Peruvian cuisine Barcelona has to offer. The young and helpful staff - ever attentive - can assist and guide you through the menú all while you sip on a delicious and expertly made Pisco Sour. Calle Londres, 103 - 08036 Barcelona.